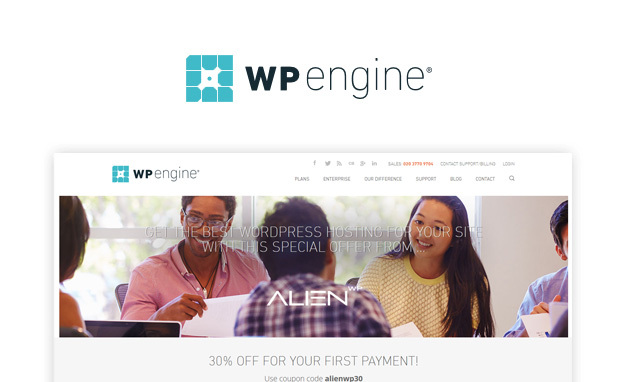 We have teamed up with WPEngine to offer you the best discount off their Managed WordPress hosting, you can use our code to get 30% discount off any of their hosting plans, if you signup for a year you will receive 5 months free in total. This is the very best coupon code available, other sites have 50% off but only for your first 3 months – our coupon is for a whole year! WPEngine are on of the largest and longest established hosts which specialize in only WordPress, they have lots of features aimed at WordPress site owners such as automatic update of WordPress core, themes and plugins and regular top our guide to the Best Hosting for WP. They include daily backups of your site to keep it safe, Free malware scans, a Firewall, SSL ready, CDN ready and some of the fastest loading speeds of any hosting company. 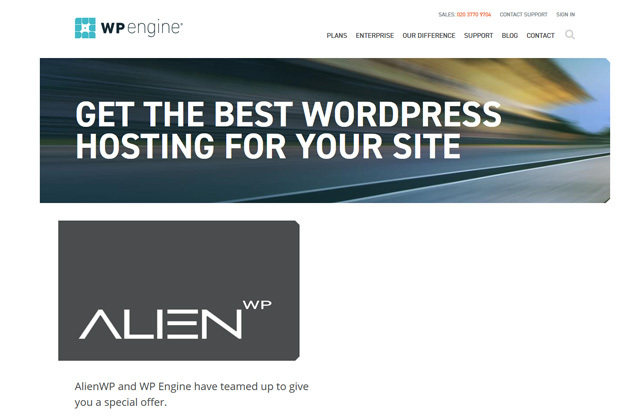 If you are a WordPress site owner who wants the best for their site, WPEngine is the go-to hosting company, to find out more about them, take a look at our indepth review. Use our exclusive coupon code to get a 20% discount off your first payment which means 4 months free if you purchase a year. 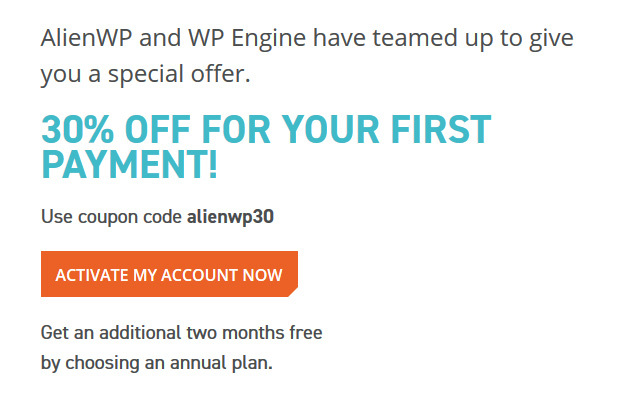 To claim your discount, it’s quite simple: After clicking our link above you will be taken to the special AlienWP landing page which you will see displays our logo as we have partnered with them to bring you this offer. You then have to click the “Activate My Account” link to get started creating your account with WPEngine. 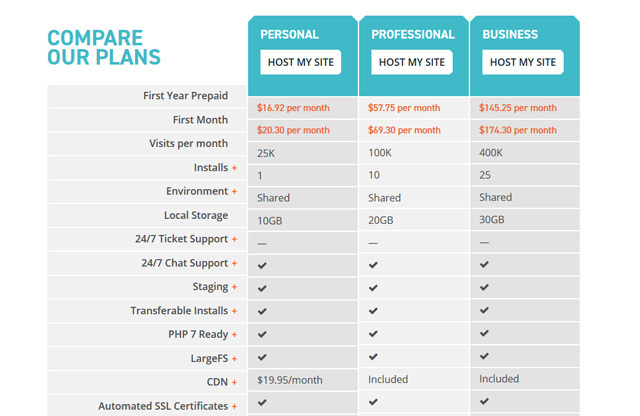 You can then choose which plan you would like to signup for, you will see a table which shows what features and account limits come with each plan so you can choose the best one for your website. After choosing which plan you’d like to go with you will be taken to a payment page where you will see your 30% off discount has been applied, you can then choose the annual option giving you a further 2 months Free, bringing your total discount to 5 months free! We think you will be happy with WPEngine, don’t forget to leave a review on our WPEngine guide and share your experiences with others.